Like stumbling upon buried artifacts, finding a roll of someone else's exposed film can reveal a glimpse into an unknown past. I found this roll of 35mm Kodak Gold 200 inside a Yashica 70SE, point-n-shoot camera, at a local thrift store. The camera was inexpensive and the thought of seeing what was on the film was irresistible. I will admit that the findings were less than stellar, but still worth the effort. I chose to post these frames prior to where someone had opened the camera back, hence the acute light leakage. The camera's time stamp is dated October 7, 2002. I can't confirm the date is true, but I do know that Yashica's film camera production ended in 2005 and the 70SE was a latter model, so I'd say the date is near enough. 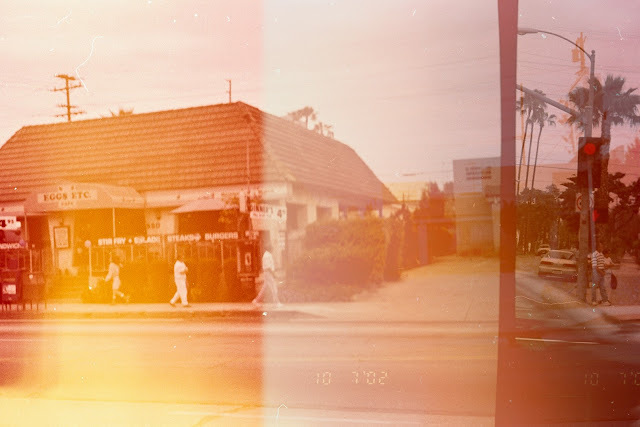 After a little research, I found that these images — off-set frames and my post processed double exposure — are of a small restaurant in Long Beach, California; Eggs Etc. According to their website, Eggs Etc has been around since 1975 and is still serving up good food at 6th and Redondo Avenue. Oh, and the Yashica 70SE, it's in great working condition.